photo: New England Ladder Co.
New England Ladder Co., the exclusive eastern U.S. distributor of Hasegawa tripod ladders, is expanding its dealer network after being acquired by new ownership. Hasegawa tripod ladders feature a wide base, deep double rung steps, spring loaded telescopic back leg and broad clawed feet with attachable rubber safety feet included for use on hard surfaces. 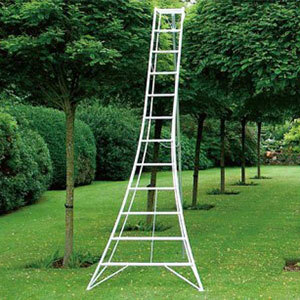 The ladders are made of hand-welded extruded industrial aluminum—with no nuts, bolts, rivets—and are ANSI Type 1A rated for 300 pounds. The standard tripod is available in 5 sizes: 6 foot, weighing 19 pounds; 8 foot, weighing 24 pounds; 10 foot, weighing 30 pounds, 12 foot, weighing 37 pounds; and 16 foot, weighing 42 pounds. The platform tripod is available in 4 sizes: 6 foot, weighing 19 pounds; 8 foot, weighing 24 pounds; 10 foot, weighing 31 pounds; and 12 foot, weighing 39 pounds. The company distributes out of warehouses in New Hampshire, New York, Florida and Texas to support its expanding dealer network.